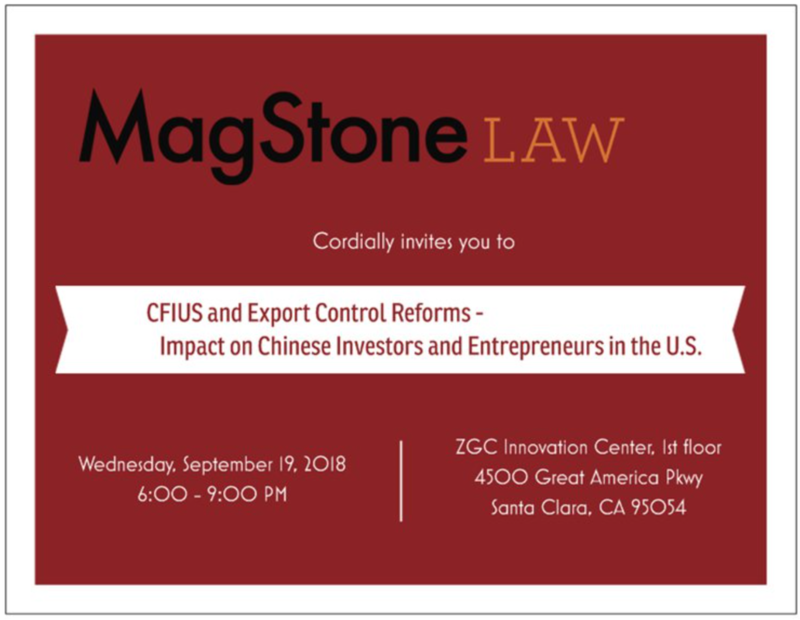 CFIUS and Export Control Reforms - Impact on Chinese Investors and Entrepreneurs in the U.S.
For introduction in Chinese, please click here. Jeremy Marwell is a partner in the Washington, D.C. office of Vinson & Elkins LLP, with a focus on constitutional, administrative, and regulatory law. His practice involves civil, administrative, and criminal matters at all levels of the federal court system, as well as regulatory counseling and practice before the Committee on Foreign Investment in the United States (“CFIUS”) and other federal agencies. ​Before joining V&E in 2010, Jeremy served as a law clerk for Associate Justice Sonia Sotomayor of the Supreme Court of the United States and Judge Stephen F. Williams of the U.S. Court of Appeals for the D.C. Circuit. He also served in the Office of Legal Counsel at the U.S. Department of Justice, where he provided legal advice and analysis to the White House and federal agencies on a wide range of constitutional and statutory issues. While at DOJ, Jeremy worked with the Department’s representative to CFIUS and the inter-agency group that wrote the implementing regulations for the Foreign Investment and National Security Act of 2007. Jeremy has a broad and active CFIUS practice, which has involved a wide range of current issues such as cybersecurity protections, access to sensitive U.S. personal data, nuclear energy matters, dual-use technology, satellites, oil and gas exploration and production investments, and acquisitions by foreign state-owned entities of energy infrastructure and a diverse range of other businesses. His CFIUS practice includes a substantial focus on matters involving Chinese private investors, funds, and state-owned entities. Jenna Glass is a Senior Export Controls Advisor for Sandler, Travis & Rosenberg, P.A., resident in the San Francisco office. She focuses on the Export Administration Regulations, International Traffic in Arms Regulations, and Office of Foreign Assets Control sanctions matters and consults with clients across various industries in the development and implementation of their compliance programs, export and deemed export licensing, investigations and enforcement matters, and provides related advice. Ms. Glass works with clients in a broad range of industries, including biotechnology, semiconductor, manufacturing, computing, among many others. Ms. Glass has more than a decade of experience in international trade compliance and regularly addresses export control matters involving China. This experience includes working with clients to identify controlled technology, obtaining U.S. government export licenses, and establishing export compliance programs for transfers of technology to China technology and manufacturing partners. Prior to joining the firm, Ms. Glass worked in-house at a leading U.S. technology company, where her responsibilities included overseeing compliance operations in the U.S., Europe, and Asia-Pacific regions as well as developing, promulgating export control policies and procedures, and working directly with regional regulatory officials in an effort to better facilitate trade. Ms. Glass is an active member in the trade community and currently co-chairs CompTIA’s Best Practices Subcommittee. She holds a juris doctorate from Santa Clara University and a B.A. in international studies from Colorado State University. Catherine, the founding partner of MagStone Law, LLP, is a seasoned corporate attorney, with over a decade of experience representing public and private companies and investment banks in corporate and finance matters. 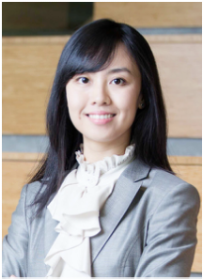 In her private company practice, Ms. Liu advises start-up and emerging growth enterprises from formation through acquisition or initial public offering in matters including venture capital financing, equity financing, operational compliance and technology development (including licensing, distribution and other technology transfer matters). She also represents venture capital firms and angel investors in their investments in start-up companies. 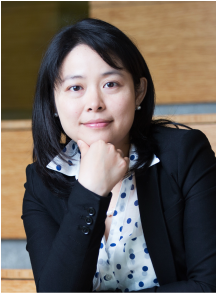 In her public ﻿company practice, Ms. Liu advises on both registered and unregistered securities offerings, executive compensation, mergers and acquisitions, corporate governance, periodic reporting and tender offers. Mandy is the founding partner of Magstone Law. Located in San Francisco, Mandy is a seasoned corporate attorney, with over a decade of experience representing U.S. and Chinese public and private companies and financial institutions in connection with a variety of M&A, joint venture, venture financing and capital market transactions. (650) 513 2555 ext. 103.